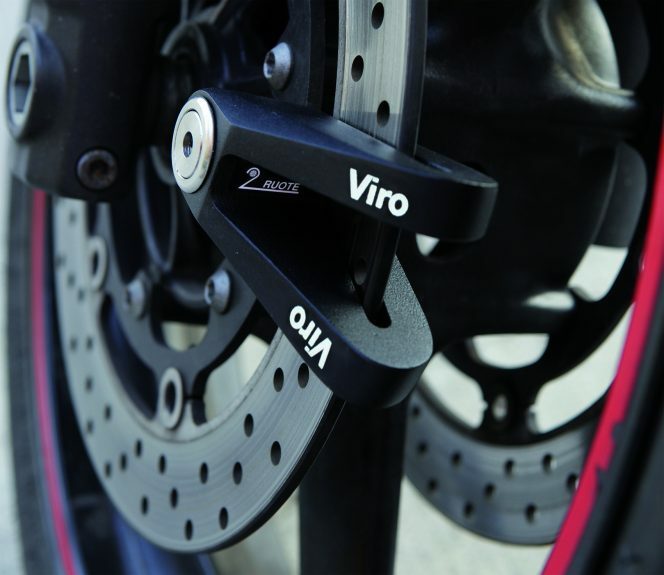 In the previous blog we talked about how to choose a good quality chain to protect your bikes. When it comes to motorcycles or mopeds, a padlock + chain locking system may not be enough and, in order to sleep more soundly, it may be useful to integrate it with additional protection, such as a disc lock. 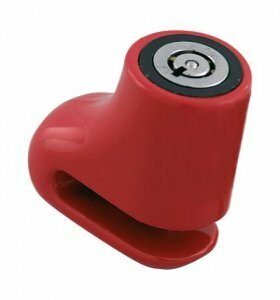 The disc lock is a widely used anti-theft system on mopeds and motorcycles as they are very easy to use: quick to put on and take off, don’t take up much space and are not very heavy. However, disc stops have some security limitations which are important to know, especially to be able to use them in the best possible way. Disc locks are relatively lightweight, compact, quick to apply and remove. In a word, they are very convenient. The best products are also characterised by a high mechanical resistance and have secure locks. The Viro New Hardened, for example, has a single-piece body made of case-hardened, tempered steel which is copper, chrome and nickel-plated. The lock-bolt, which can have a diameter of up to 14 mm, is made from the same material. 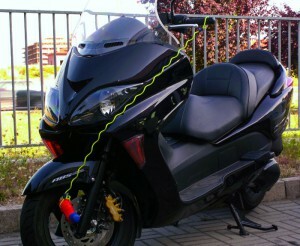 It is therefore an anti-theft system which is particularly resistant to attacks with hammers, levers and cutting tools. From the point of view of the lock, it has a stainless steel plug with 6 discs which are hard to open by lock picking and immune to key bumping. 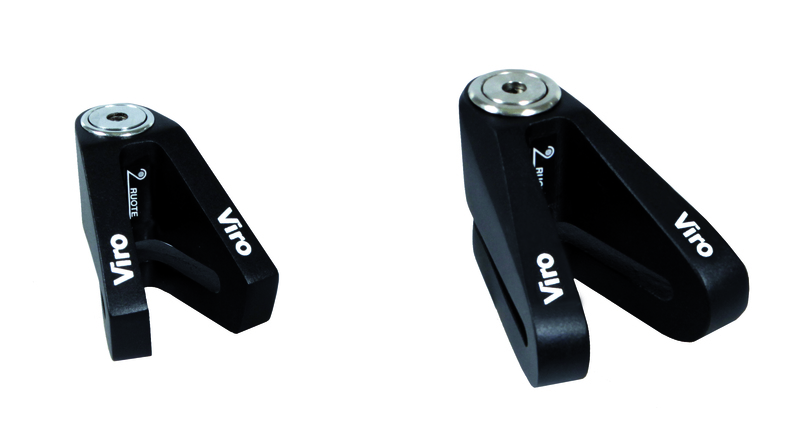 The Viro New Hardened is an extremely strong disc lock because it is made entirely of steel. In addition to the mechanical protection, the disc lock can offer an additional electronic protection. The disc locks fitted with a siren, such as the Viro Sonar or the Viro Echo, emit an audible alarm in case of attempted theft. More advanced products, such as the Viro Sonar, can even receive alert notifications and the location of the stolen motorcycle on your mobile phone, interfacing with the Viro MAS satellite anti-theft system. As always the first critical factor is the choice of a good quality product. 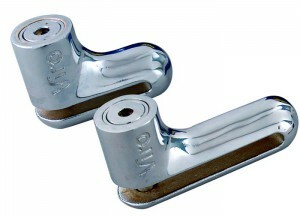 The bodies of very cheap disc locks are made of lightweight alloys, which offer very little resistance, break easily with levers or hammers, and they have locks which can be easily attacked, such as the tubular ones. Cheap disk blocks have fragile bodies and locks which are not very secure. The real risk of disc locks is that – regardless of their quality – many models can be bypassed by removing the disc from the wheel so that this can turn even if the disc lock is still in place. The ease with which the disc lock can be bypassed therefore depends on the difficulty with which one can separate the disc from the wheel. In the simplest cases it is sufficient to unscrew a few screws: an operation that requires just a few seconds, possibly using a cordless screwdriver. The discs of the rear wheels are generally more awkward to remove; for this reason the disc lock should be used on the rear wheel. To prevent a potential thief from bypassing the disc lock by loosening the brake disc, it is even better to use a disc lock for each disc. In this case, in order to neutralise them it would be necessary to deprive the motorcycle or moped of the ability to brake, thereby making it basically impossible to drive. There would always still be the possibility of loading the bike on a van, but this is true for all solutions which do not tie them to a fixed point (that’s why the best security is achieved by simultaneously using a good quality disc lock and a good quality lock combined with a sturdy chain which allows you to anchor the bike to a fixed point such as a pole or a rack). In order to avoid accidental falls and damage to the braking system, as shown in this video, it is good practice to use a “reminder” cable which connects the disc lock to the handlebars, so that one remembers to remove the disc lock before driving off. These cables are generally brightly coloured, precisely in order to maximise the visibility, and they have a spiral shape, so that they wind themselves up for storage. The reminder cable helps you remember to remove the disc lock before driving off. Otherwise, one is almost certain to fall! Of course, this is a precaution of interest mainly to those who have bought a good quality disc lock: poor quality ones are so fragile that if you drive off, forgetting to remove them, they usually break in half! This entry was posted in Locks, Motorbikes and Bicycles and tagged locks, products, technology, tips on 29 May 2018 by Mara Rossi.